A Ground Source Heat Pump is a device that takes low grade energy from the ground and converts it into useable heat that we can use to heat our houses or water. Ground Source Heat Pumps use electricity but not as a fuel but to power the process by which they convert the low grade energy into heat. Because of this Ground Source Heat Pumps are able to be highly efficient as they may only use a quarter of the electrical energy compared to the amount of heat energy they create. Ground Source Heat Pumps are designated as a renewable technology as the source from which they draw energy, the ground, is replenished by the sun every day with a peak during the summer. Ground Source Heat Pumps can be used in a large range of applications but are mainly suited to new build and refurbishment using underfloor heating. There are also a number of examples of applications of Ground Source Heat Pumps in a Case Studies section. Ground Source Heat Pumps offer running costs of up to 70% below traditional systems enabling you to never worry about turning down the heating to save money and then sitting in a cool room. Imagine the temperature in your home being constantly controlled to provide a warm and comfortable environment using a heating system that utilises renewable energy. A Ground Source Heat Pump system that requires minimal regular maintenance, that is completely safe with no local carbon emissions. The Ground Source Heat Pump system supplied come with a warranty of up to five years and has an expected life of up to twenty years, we are fully accredited Ground Source Heat Pump Installers. Ground Source Heat Pumps work by collecting heat energy from your garden and moving it into your home, essentially working as a refrigerator in reverse. Even when the weather is freezing outside a Ground Source Heat Pump will still keep your home warm and comfortable. Because a Ground Source Heat Pump is moving heat energy rather than creating it by burning gas or oil the system is more efficient providing savings of between 50 – 70% of a traditional heating system. How is the heat collected? The earth has the ability to absorb and store heat from the sun. This heat is extracted from the earth using a ground loop. The ground loop is a continuous closed loop of special pipe buried in your garden. Water is circulated through the buried pipes where it absorbs heat from the surrounding earth. The ground loop is connected to a heat pump inside your home that takes heat out of the circulating water and transfers it into your heating circuit. Summer cooling can also be achieved using a Ground Source Heat Pump by coupling the system to a ceiling mounted unit that extracts the heat from your home in the summer and transfers it into the ground where it will remain until needed to generate heat in the home again. 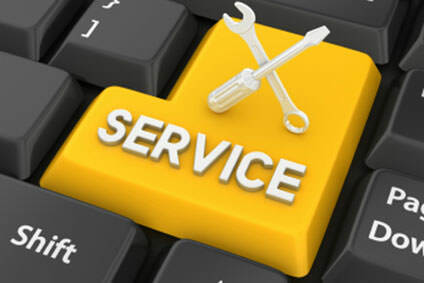 We offer a full design and installation service for Ground Source Heat Pumps all over Kent, Sussex, Surrey and London, starting from an initial site survey, full heat load calculations, provision of a fully specified quotation and then installation and handover plus any ongoing maintenance requirements. 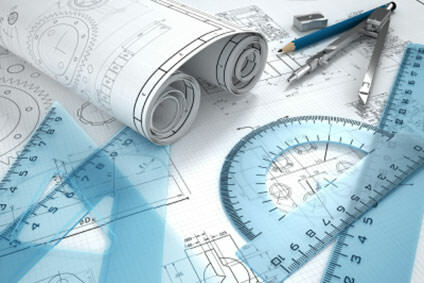 The survey and design service is Free of Charge. As Ground Source Heat Pump installers we manage all of these stages to ensure minimal disruption. We are full members of the Ground Source Heat Pump Association and work to its standards of membership. All of our Ground Source Heat Pump installations are eligible for payments under the Renewable Heat Incentive, RHI. 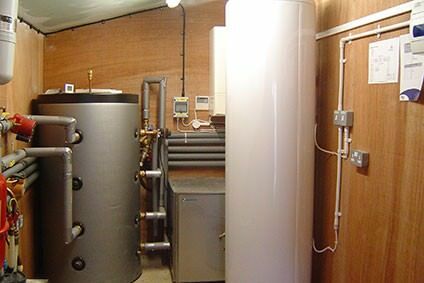 We are able to offer full Ground Source Heat Pump installation or we can fully project manage the whole installation from Groundwork, electrical installation and then connection into the existing heating and hot water systems. We have undertaken installations into existing properties, upgrading of heating systems as part of an extension and whole system design and installation incorporated into a new build project. 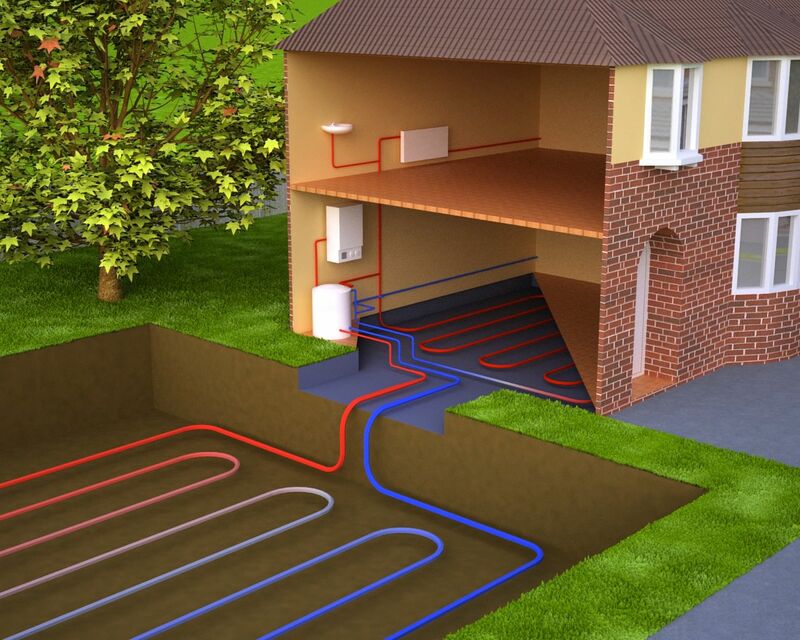 A Ground Source Heating System is an electrically powered system that taps the natural heat stored in the earth to heat your home. Heat pumps do not need a flue as there are no local emissions of any sort. When coupled with a green electricity supply your heating, hot water and electricity demands create zero Carbon Dioxide emissions, making a real contribution to the reduction of green house gasses.